Buckquoy board, Orkney Islands, Scotland. Summary on the Scottish Ard Ri. This makes in all 18 possible setups for the Ard Ri 7x7 game. In any case the Ard Ri king is captured from two sides and wins on the edge. King hammer only 2) ? 5) ? 8) ? 11) ? 14) ? 17) ? King unarmed 3) +6.00 (21 games) 6) ? 9) +3.20 (21 games) 12) +3.77 (31 games) 15) -3.40 (22 games) 18) ? 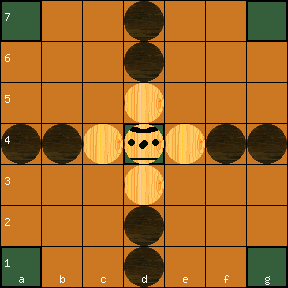 The setups 3), 9) and 12) are heavily unbalanced in favour of white (the defenders). 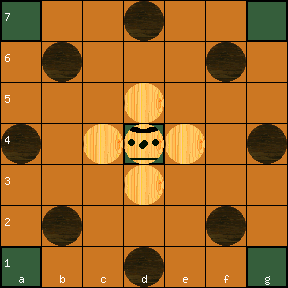 Setups 9) and 12) indicate that circle setup favours white even slightly more than cross; thus 6) is probably also unbalanced in favour of white. All these ( 3), 6), 9) and 12) ) have king unarmed. King hammer only and king armed favour white even more; thus all the setups shown in the table with hostile and friendly throne must be unbalanced in favour of white. Left are only setups with no throne. We already found a reasonable balance of setup 13) (balance +1.53). 14), 17) and 18) are unknown. However, the historical Buckquoy board shows, that the historical setup must have a throne square. As in Magpie 7x7, the king can only move one step at a time. Ard Ri-1 throneless 7x7. No throne. Black was found to always win. Ard Ri-1 7x7. With throne. The game balance found was -2.33 (attackers win 23 times per 10 defenders' wins). Ard Ri-1 friendly-throne 7x7. With friendly throne. The game balance found was -1.86 (20 games). Ard Ri throneless 7x7, balance +1.41.